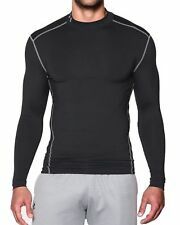 under armour thermal base layer. Condition is Used. Dispatched with Royal Mail 2nd Class Large Letter. under armour base layer top. Condition is Used. Dispatched with Royal Mail 2nd Class Large Letter. Under Armour Ski /Snowboard/wet Weather Trousers Midnight Blue Size MD. 30” waist (has elasticated back waistband) 31” inside leg. Condition is like new. Dispatched with Royal Mail 2nd Class. Youth Under Armour cold gear base layer size M in very good used condition. Very warm base layer. ColdGear® Infrared technology uses a soft, thermo-conductive inner coating to absorb & retain your own body heat. 60g PrimaLoft® Black insulation is lightweight, water-resistant, breathable & can be compressed without losing warmth. ColdGear® Infrared technology uses a soft, thermo-conductive inner coating to absorb & retain your own body heat. Jim saw the potential and signed on the dotted line ! New arrivals. Excellent Prices. UA Storm technology repels water without sacrificing breathability. All goods remain the property of HOTGOLF LTD until paid for in full. This fee will depend on the size of the order and will be quoted should you wish to cancel the order. The Armour Fleece construction is lightweight, quick-drying but is still amazingly warm whilst the UA Storm finish repels rain & snow without sacrificing breathability. As well as keeping out the cold the polyester material wicks sweat and is quick drying so you remain comfortable when working up a sweat. Condition is Used. Size - Small. Beautifully comfortable and warm soft knit beanie. Under Armour Long Sleeve Top, Youth, Cold Gear Thermal Base Layer. Label says YLG, youth large. I bought it for my 13 yo and it is wearable but rather snug. I would say more like 11 yo. Jim saw the potential and signed on the dotted line ! New arrivals. 3-layer bonded fabric. Excellent Prices. High quality products at amazing prices. Jackets & Coats. New Under Armour UA Full zip Down Hooded Puffy Jacket. UA Storm technology repels water without sacrificing breathability. Style Ski Jacket. Size Type Regular. Sport Snowboarding. New Under Armour ColdGear Storm Haines Shell Jacket. Lining: 100% Nylon. Size Type Regular. Loose : Fuller cut for complete comfort. Material Polyester / Nylon. Body: 100% Polyester. New Under Armour UA ColdGear Infrared Revy Jacket. Size Type Regular. MPN 1280812. Primaloft Insulation. New Under Armour UA Bacca Ski Snowboard Soft shell Jacket. Fitted : Next-to-skin without the squeeze. Heathered knit exterior with a cozy high-loft fleece interior to trap heat for lasting warmth. 3-layer, 4-way stretch Softer shell construction. 900 - Camo. Material Wool Blend. Type Base Layers. It has been designed to perfectly adapt to the body, regulate its temperature and reduce muscle fatigue. New Under Armour ColdGear Infrared Werewolf. Ski Snowboard Soft Shell Jacket. Style Padded Soft Shell. Fill zip front with stand collar for extra protection. Secure hand pockets with audio port. UA Storm technology repels water but stays soft & breathable for superior comfort. New Under Armour Alpinite Max Jacket. Style Puffer Poly Fill. ColdGear cuffs add stretch and warmth that shuts out the chill. ColdGear Infrared uses a soft, thermo-conductive inner coating to absorb and retain your own body heat. Color Blue. 411 - Midnight Blue. ColdGear Infrared uses a soft, thermo-conductive inner coating to absorb and retain your own body heat. ColdGear cuffs to shut out the chill. New Under Armour Receptor Soft Shell Jacket. Bonded 3-layer softshell material with a warm brushed inner layer. Ankle zipper opening. Reinforced knees for superior durability. Zippered cargo pockets. Loose : Generous, more relaxed fit. New Under Armour UA ColdGear Infrared Boreal. Down Blend Ski Snowboard Jacket. ColdGear Infrared uses a soft, thermo-conductive inner coating to absorb and retain your own body heat. 100% waterproof & breathable, with fully taped seams. ColdGear® Infrared technology uses a soft, thermo-conductive inner coating to absorb & retain your own body heat. Reinforced cuffs provide protection from ski edges. UA UGrow system allows pants hem to grow 2" to last an extra season. New Under Armour UA ColdGear Infrared Porter 3 In 1Jacket. ColdGear Infrared technology uses a soft, thermo-conductive inner coating to absorb & retain your own body heat. Style Ski Jacket. ZIP-OUT LINER JACKET. New Under Armour UA ColdGear Infrared GTX Chugach Jacket. ColdGear cuffs. Style Ski Jacket. Chin guard for comfort. Storm3 - Waterproof / windproof. 2-way adjustable hood for weatherproof fit. The Wire phone tether - carefree cell phone use, you won't drop your phone. New Under Armour EVO ColdGear Crew Layering Shirt. Material Polyester. Type Base Layers. Sleeve Length Long Sleeve. New Under Armour ColdGear Snowcrest Mittens. Size Small. 943 - Camo. Material Wool Blend. Type Base Layers. Style Bottom. New Under Armour UA ColdGear Powerline Jacket. UA Storm technology repels water without sacrificing breathability. Style Ski Jacket. 100% waterproof & breathable, with fully taped seams. Size Type Regular. ColdGear® Infrared technology uses a soft, thermo-conductive inner coating to absorb & retain your own body heat. Reinforced cuffs provide protection from ski edges. Gender Girls. UA UGrow system allows pants hem to grow 2" to last an extra season. New Under Armour UA Wool Waffle Crew Layering Shirt. Material Wool Blend.